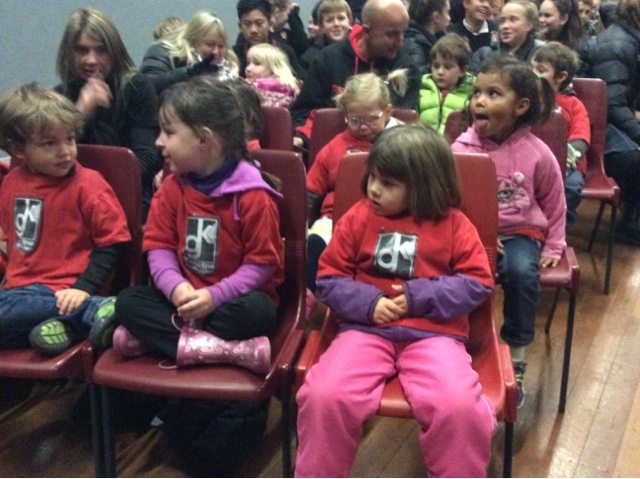 From our visit to Te Ana Rock Art Centre we organised a reciporcal visit to Kindergarten. 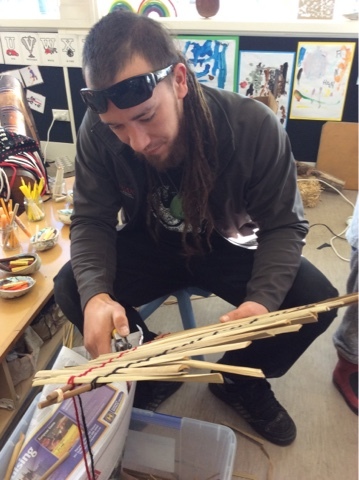 Rachel and Wes arrived with the resources to mahi tahi with the children to construct a kite - this links with our activities we have been doing while celebrating matariki. Wes explained that they import toi toi and flax from Argentina providing different colours and as he said, "They are a lot nicer to look at!" He also added that the toi toi leaves last longer when sprayed with hairspray. 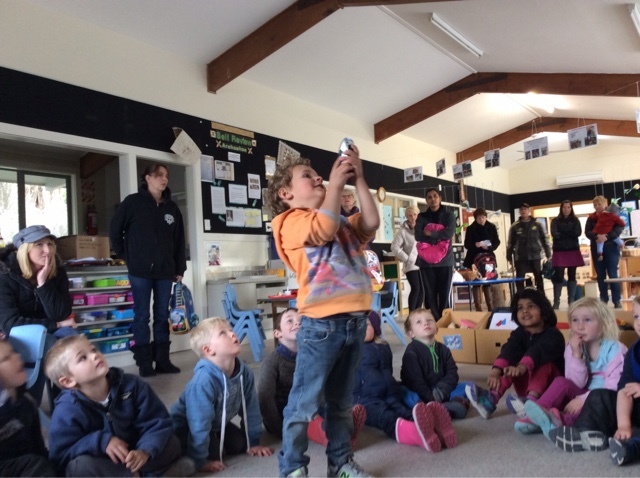 While the kite was being constructed the children applied their construction skills to make a whetu/stars. 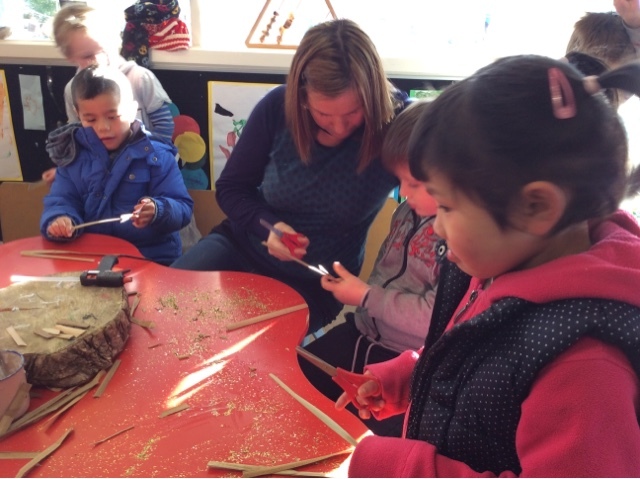 Natasha and Ashleigh expertly guided the children to strive for accuracy when cutting the flax to size and glue together their whetu shapes. From the visit we are now would like to purchase a New Zealand flax to plant in the garden and use the frongs for future activities. What an adventure we were up to ,clearly reflected in the children's expressions of wonderment and awe in anticipation of the morning ahead . 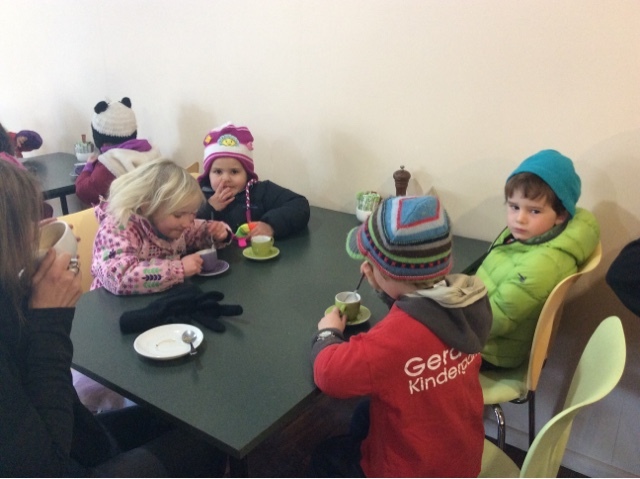 We were off the see the High School Production of " The Snowman " but on our way we needed to stop and have a " fluffy" at our local cafe ( all part of the cultural experience) . 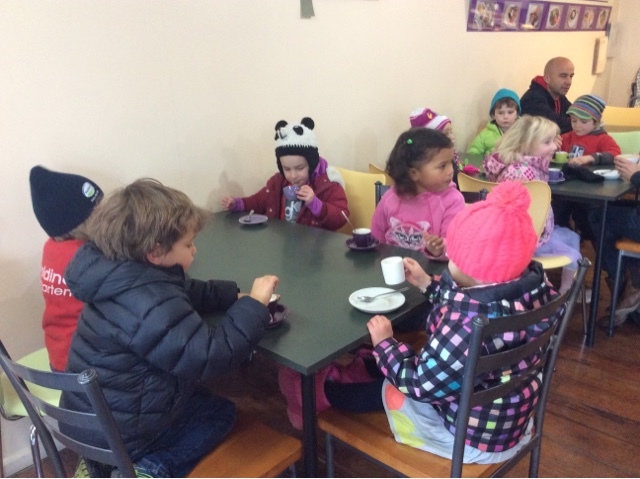 We chatted before we left about what Manaakitanga might look and sound like at the cafe and then at the show " It would mean we need to be really quiet " suggested one child. " We need to really listen and stay in our seats" suggested another experienced theatre goer . And sure enough in both experiences our children were absolute experts at modelling respect . At the show they were all mesmerised by the characters and the singing and dancing and afterwards we got to meet our favourite characters . We also had our morning tea at the high school waiting for the students to come back out in uniform so that it supported our understanding of what is real and what was just pretend . What a wonderful experience to share with our friends . Brownie and Silkie have been very busy laying lots of eggs and before we knew it we had around 25 sitting in the egg basket. What to make? 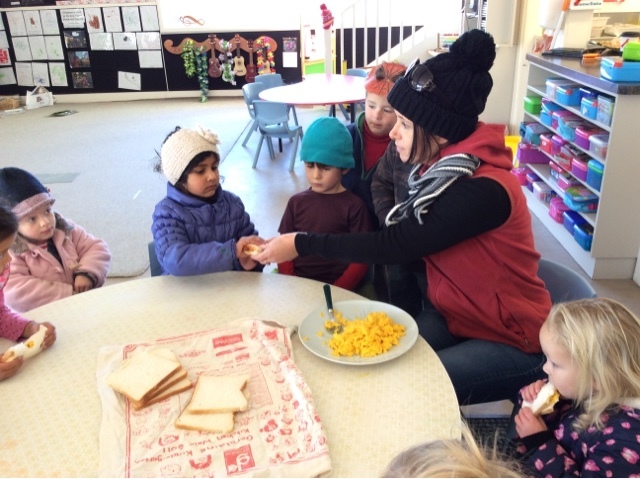 Scrambled eggs was the order of the day as we had been discussing different ideas for breakfast with our up coming Pyjama Party Breakfast. 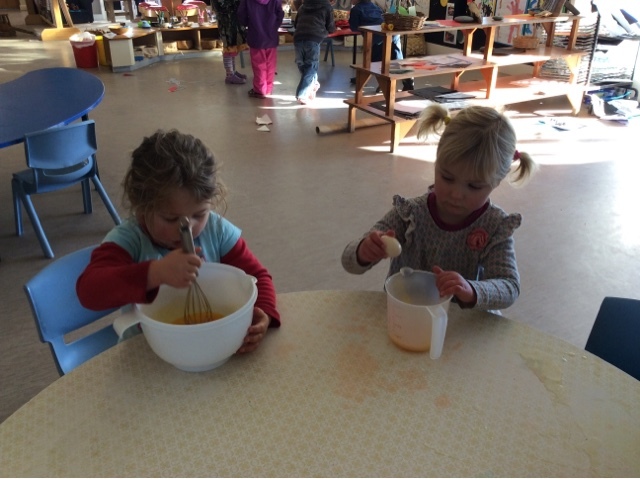 Louise worked alongside the tamariki to crack and whisk the eggs. But how to know if all those eggs were fresh? Sandra explained that we could try putting them in a bowl of water. If an egg sinks, it's fresh. If it floats, it could be rotten. So some experimenting and problem solving occurred as we placed eggs carefully into a bowl of water. Lucky there were only two floaters that went to the compost bin! Then we turned on the electric fry pan. We had to do some more problem solving as the cord was far too short to reach the kitchen. "You need another one of those things," suggested Pippa, pointing to the cord. "There's a long white one somewhere," remembered Wilbur. So we used an extension cord to connect the fry pan to the socket in the kitchen. That’s good thinking. He pai koe ki te whakaaro pena. 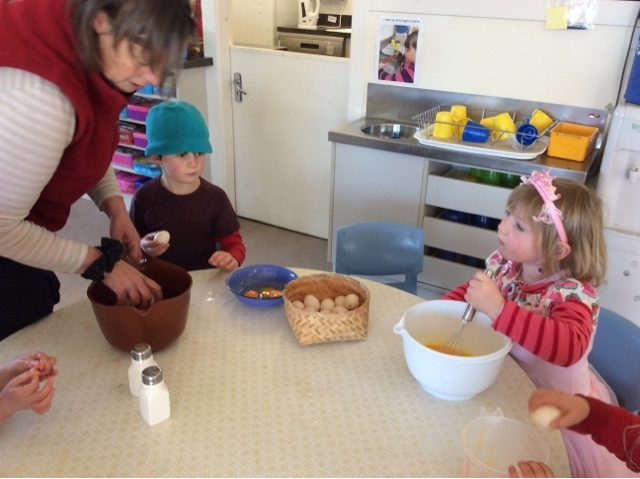 Sandra scrambled up the eggs while the tamariki managed their impulsivity around the hot pan. 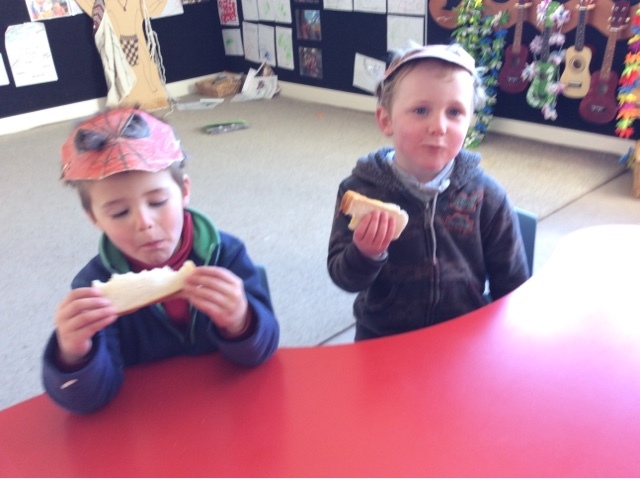 Then we enjoyed the eggs in some fresh white bread for morning tea. What a treat! Tino pai. Great stuff. There are still some eggs left and we are sure to get more from our busy hens....pancakes next? 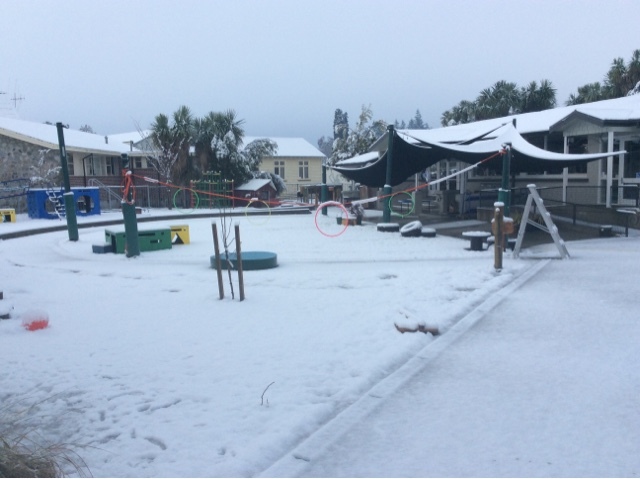 We have had lots of photos shared though Educa ( our eportfolios ) of children having fun in the snow with their families on Friday when most people in Geraldine had a day at home to play . 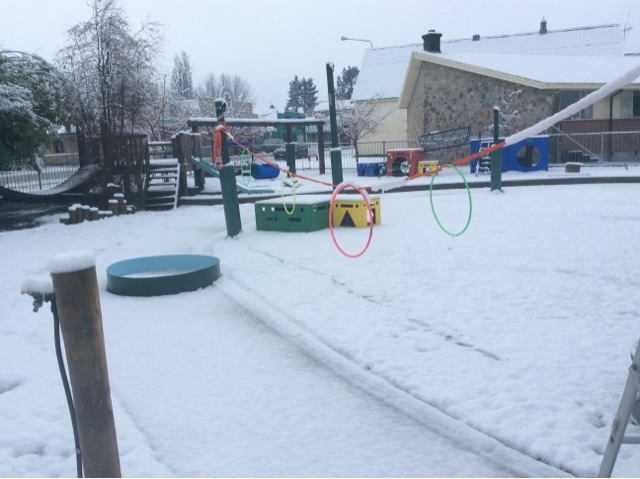 Kindergarten looked like a winter wonderland but had nobody to play and explore it ,until this morning when we made use of the snow where we could . 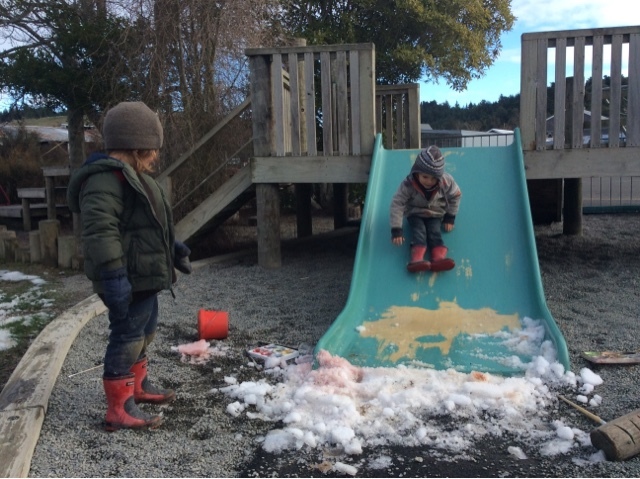 The snow at the bottom of the slide was left for children to gather data through all their senses as they landed in it in varying positions . 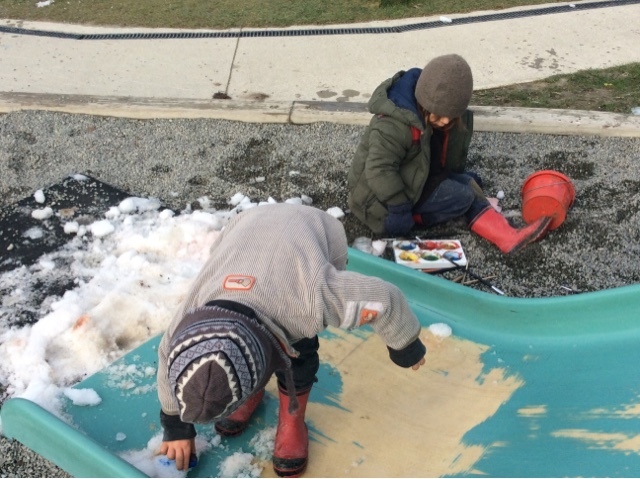 Paint was also placed alongside to explore the snow in a different way. Inside the snow was bought in to explore absorption properties with eye droppers and food colouring ... An interesting science experiment . The snow was fun , the melting and slush that remains not quite so , but maybe we will get to explore and play in the snow again before winter ends . ( and keep the power) What do you think?, he aha o whakaro? This morning while we were all sitting at kotahitanga, a surprise visitor walked in the door, as I got up to meet Jacob's grandma I got a huge surprise when I looked in her basket. 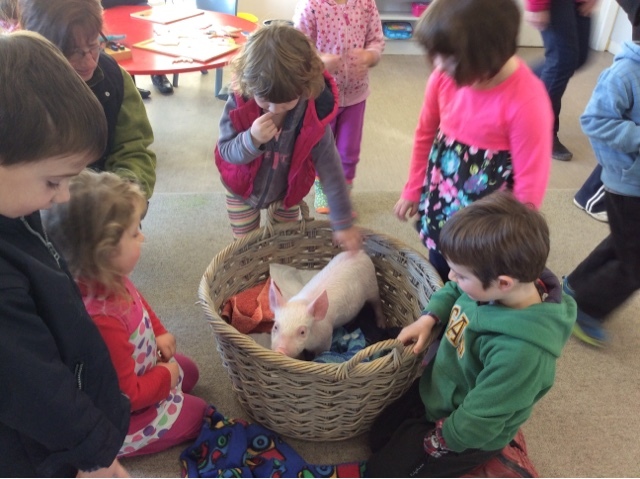 A piglet was sitting in there looking up at me, so I shared with the children that there was someone special here to see us and carefully picked up the piglet. Āe mārika, How about that! They were all very excited to see this special visitor and started asking different questions. 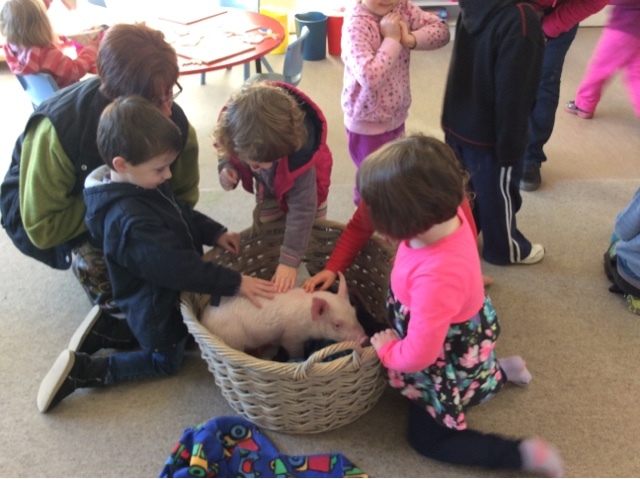 As we all sat in a circle showing manaakitanga/ care and respect for the piglet he began running around the floor exploring the kindergarten. 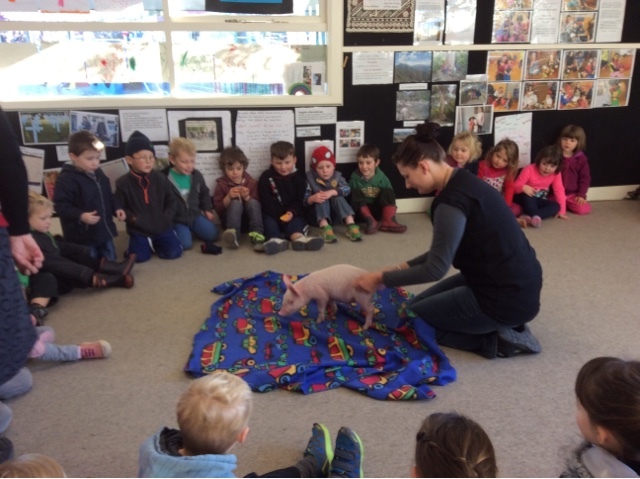 We got told his name was Bob and the children all found great humour at a pig being called Bob. We enjoyed sitting watching where Bob wanted to explore and as we watched we managed our impulsivity trying to sit still so we did not give him a fright. Because we had all just been sharing some fruit we wondered if Bob would also like to have some fruit so we gave him a piece of apple, and it wasn't long before he was snorting and munching on the fruit. It took a while for the children to find the jumping, balancing fun under the umbrella! But it brought all the boys together to shout their delight as they stepped, leaped, and tumbled their way around the padded shapes. Heather lended out the door from inside and commented, "They found the shapes then!" She could hear the noise of the shouts of laughter as they laughed at their themselves landing in different ways! Katakata/finding humour! 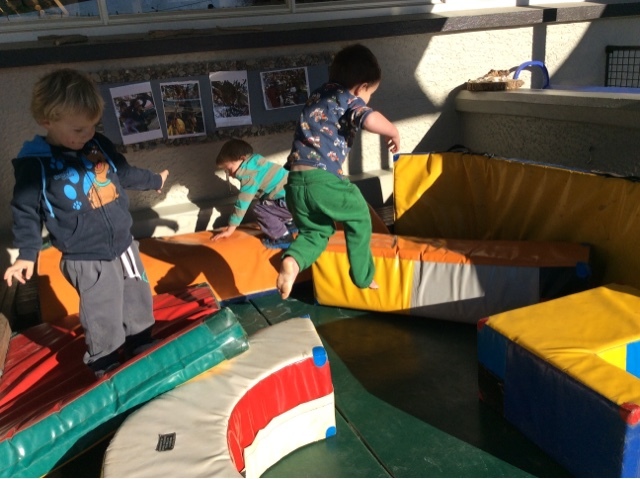 The activity using the padded shapes are bringing the boys to mahi tahi/work together as they walk around on uneven ground and find the space in which to land. Tumeke e tama! This morning we went on an adventure. 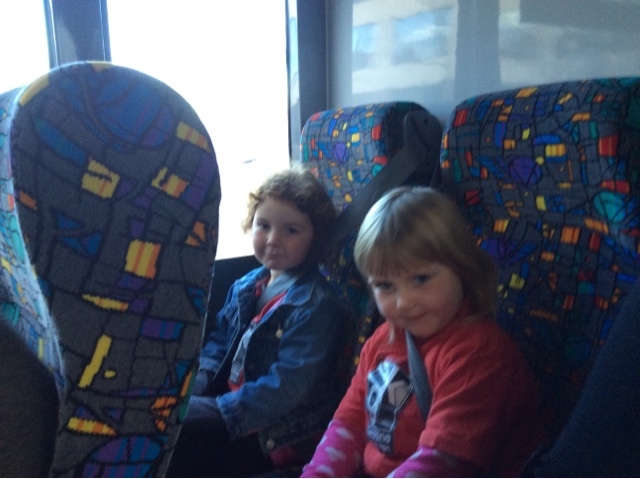 A bus picked us up from kindergarten and we drove to Timaru. 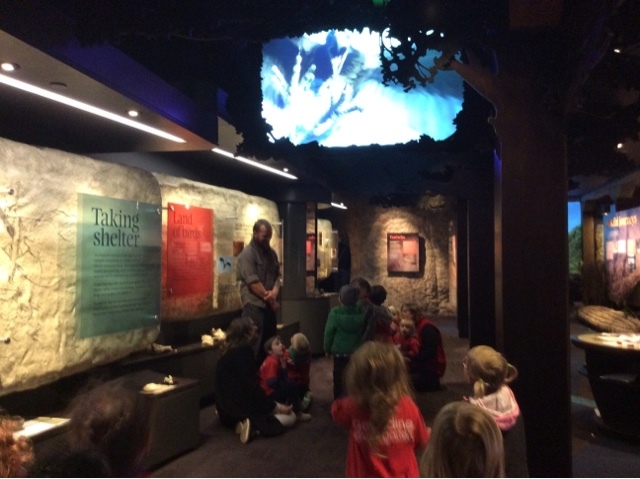 We visited Te Ana Maori Rock Art Center, to support us in beginning our journey of finding out the stories of our place and those of mana whenua. 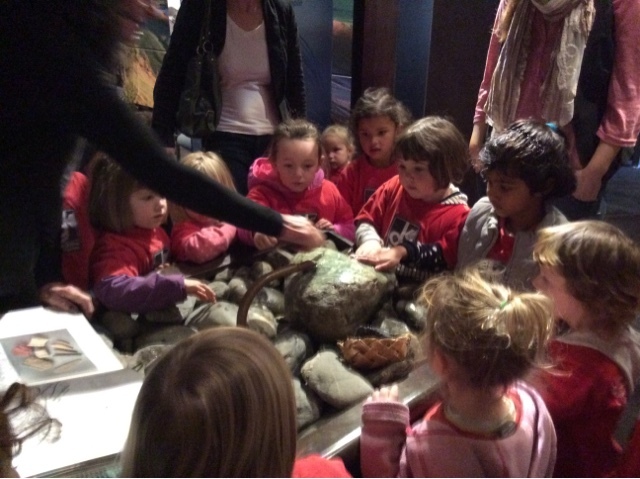 We spent time exploring the different information stations, using all of our senses to gather information. 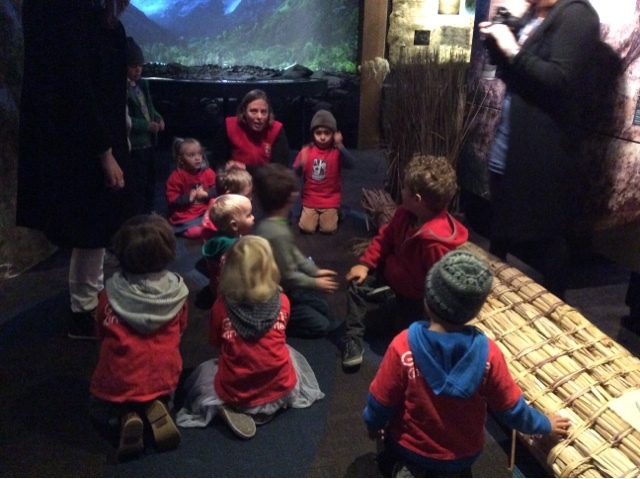 It was a fun and interactive environment to be in, learning about the people who came before us and the ways they used the land to survive. We enjoyed exploring a big piece of ponamu/green stone that had water trickling over it. While using our hands to touch the green stone the tour guide told us a story about the dark markings on it that represent historic pictures. At the end of our visit we took the time to reflect on what we had found out, by each drawing a picture and sharing our ideas. 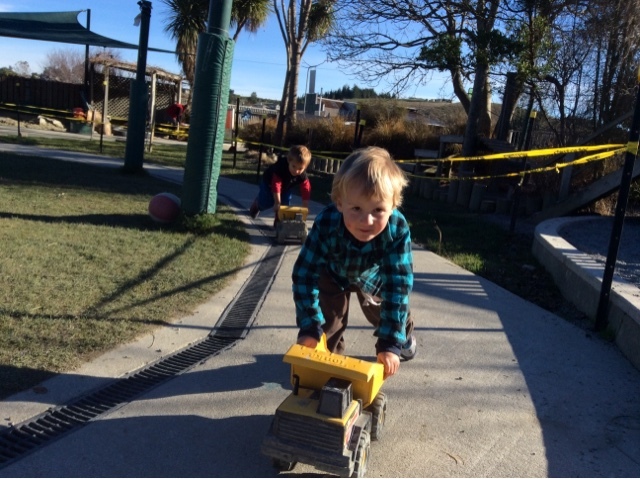 Children who attend both our morning and afternoon sessions enjoy using the yellow dump trucks. 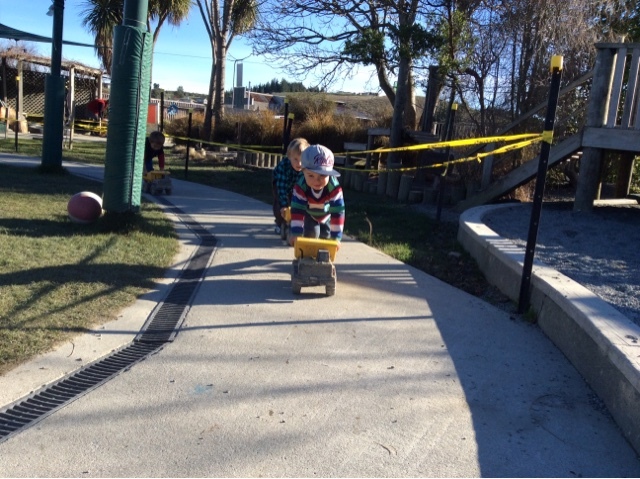 Used in lots of different areas in the kindergarten, including the sandpit, the concrete track, and in the stones for a variety of purposes. 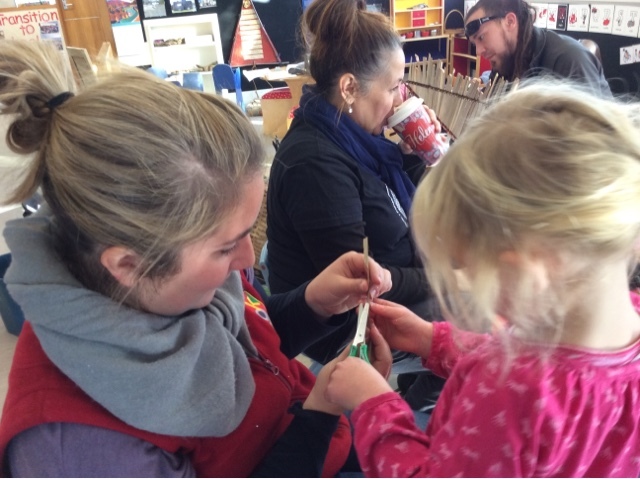 Toia te waka – mahia te mahi - Be actively involved. 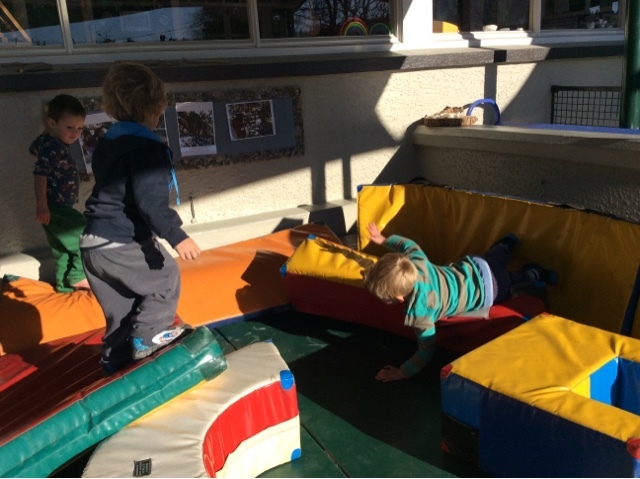 This includes carrying other play equipment like hammers, wood, plastic animals,mballs, paper and pens to different areas of the kindergarten where they are needed . 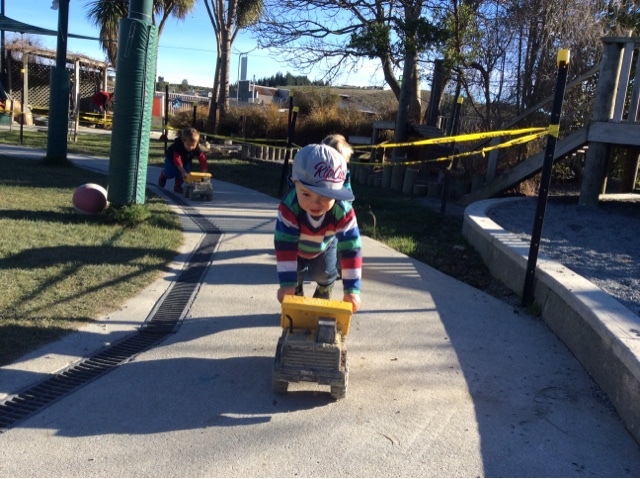 One of the most significant roles the trucks play is supporting the developing relationships of children. Malachi, Thomas and Braxton enjoyed play in the sandpit alongside each other this afternoon before setting off around the path in a 'race'. Lots of eye contact was being used with smiles as they would stop and look at each other before pushing the trucks around the track again. 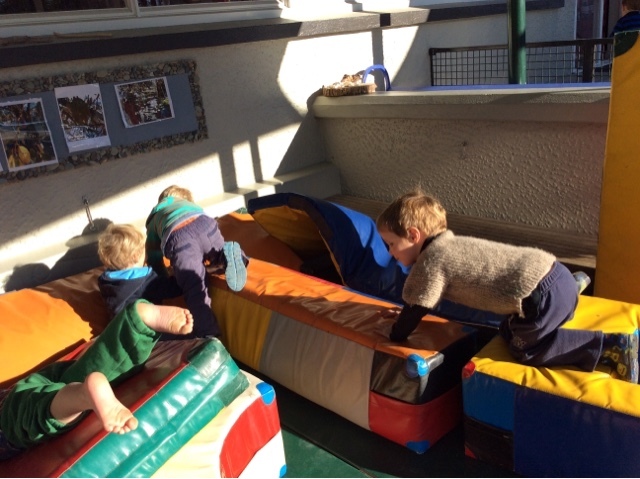 These boys haven't been at kindergarten for long so teachers ensure that they introduce the boys to one another and use each of the children's names to support them in getting to know one another better. 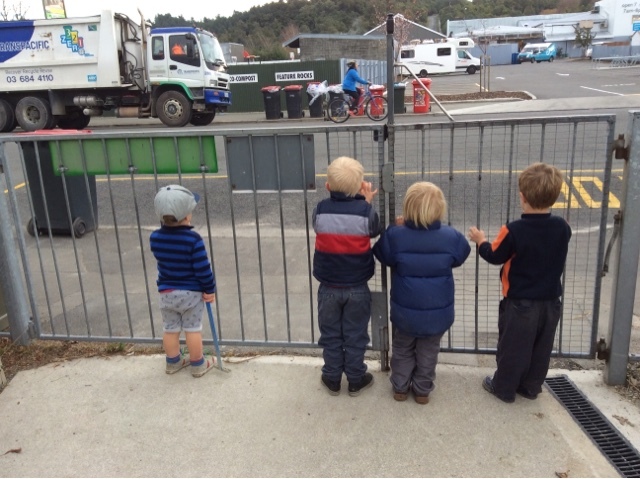 This afternoon a small group of children took a real interest in watching the rubbish truck collect our rubbish bin and then carry on down the street and across the road to collect the line of rubbish bins from the supermarket. Children commented on the number of rubbish bins that were on the side of the street, using their fingers to support their counting. 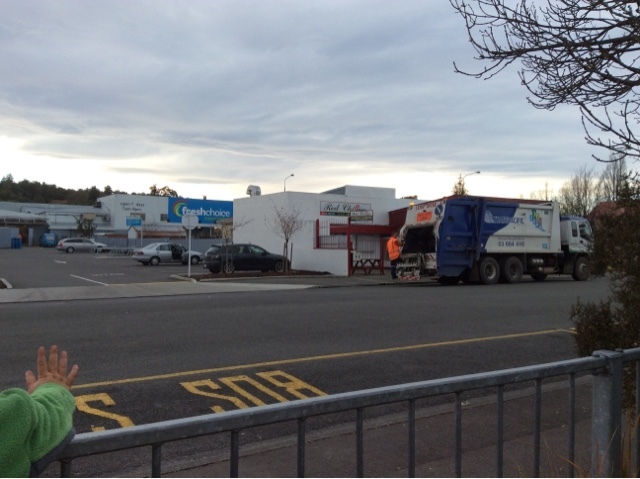 "There is 5" Ivor commented while holding his hand up to indicate how many bins were across the road. This is great - he rawe tēnā! 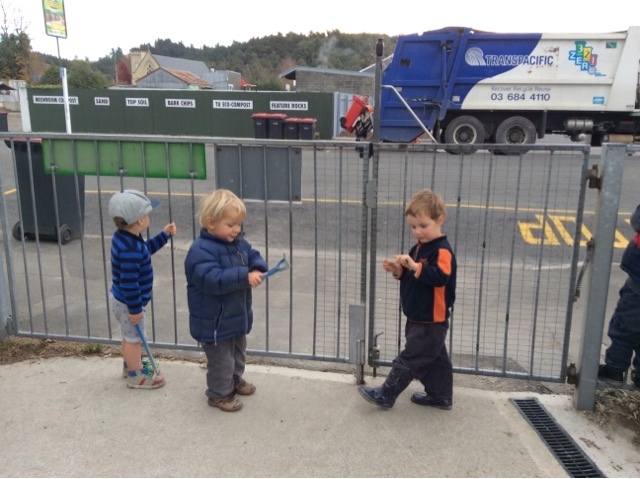 This is an example of early literacy skills being supported in play, where the children's interest in the rubbish truck supports their learning. 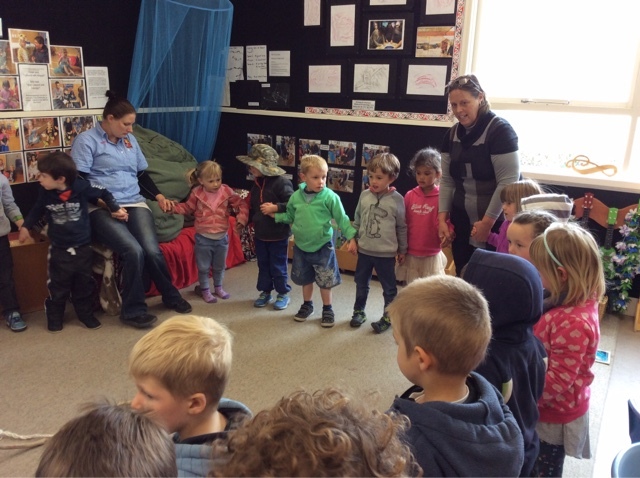 Whanaungatanga/relationships were being developed in this small experience as children stood alongside each other, sharing their ideas and listening to others. 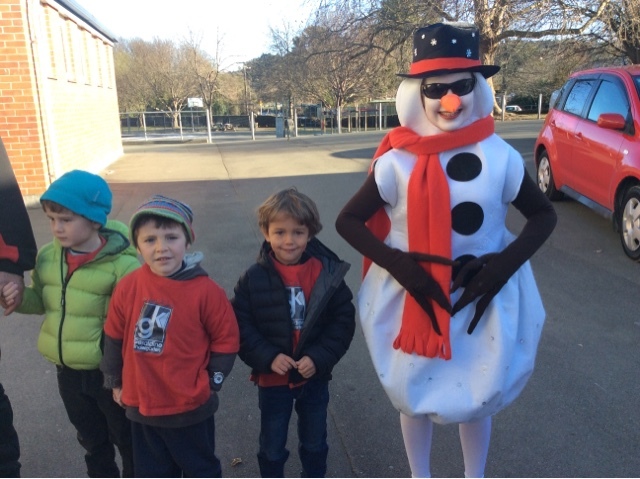 This is great - he rawe tēnā! 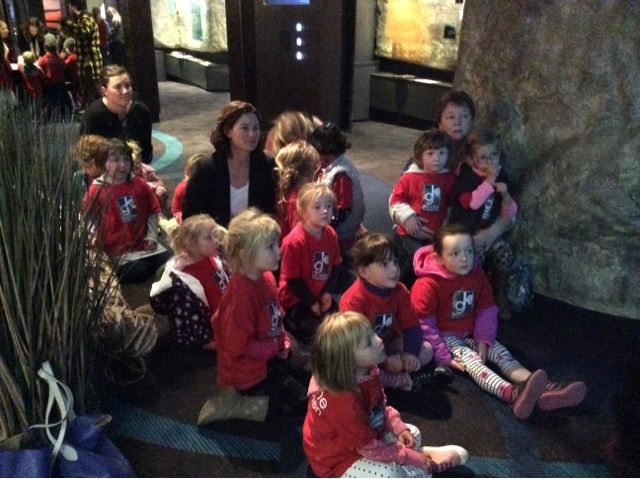 The legend of Maui have been very popular with the children! Maui is known to have gone fishing with his brothers and Archie linked his own adventure of being Chief Tarahaoa going hunting for food. He said, "I really like this story! Maui has a hook!" Archie had the rope, the stick and the book! As we read the story Archie identidfied the sting ray shape that Maui had hooked up and his brothers chopped up to form the valleys and hills of the Te ika te Maui - North Island. 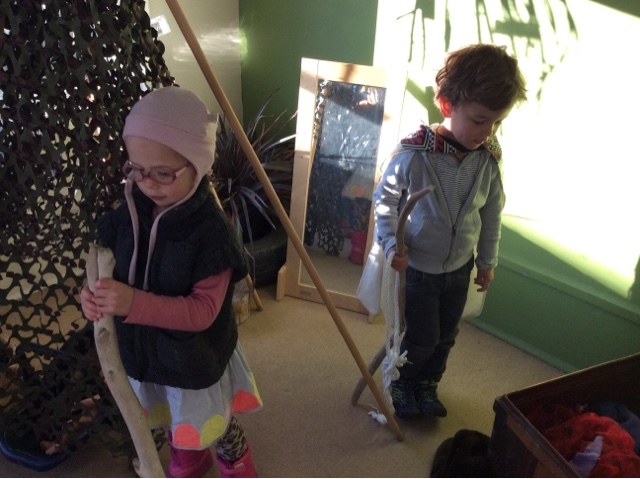 Reading together, Archie and Charlotte, act out their understanding of the legend; one with a stick, one with a rope! (Links to another story we shared called 'The Spooky Tree). They were able to transfer the props from one story to another! 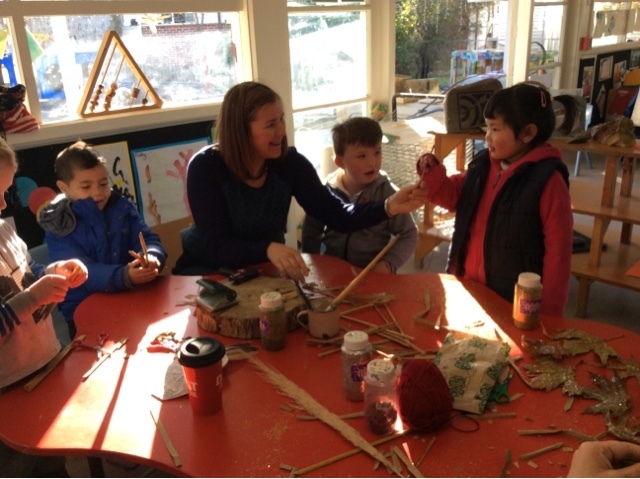 It has been inspirational to observe the children of Geraldine Kindergarten return to things we have done together as a team. Drawing upon past experiences supports children to make their own theories of the world and helping to explain 'what is their world?" (Links with our current group story for Term 2). To support children top apply new knowledge we could ask, "Where else could you apply this...? ", "What would it be like if...?" 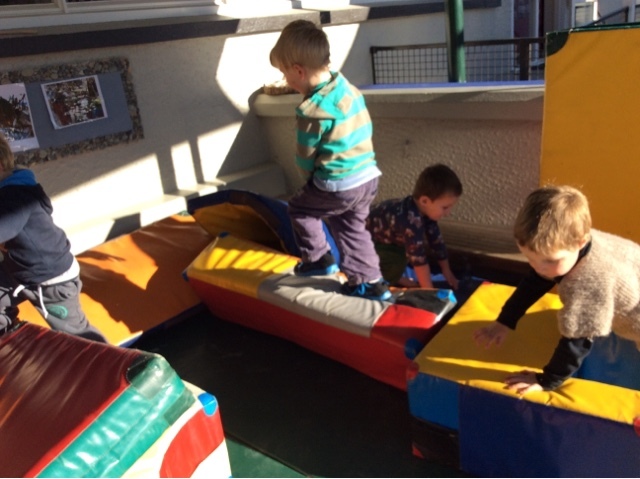 This week the children have been exploring dramtic play. 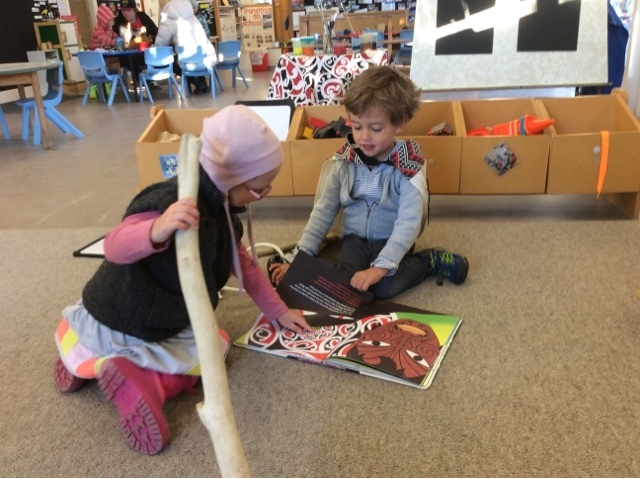 Louise used one of our favourite stories "The Spooky Old Tree" by Stan and Jan Berenstein to act out an imaginary adventure. However, Louse adapted the story and related it to our local landmarks. 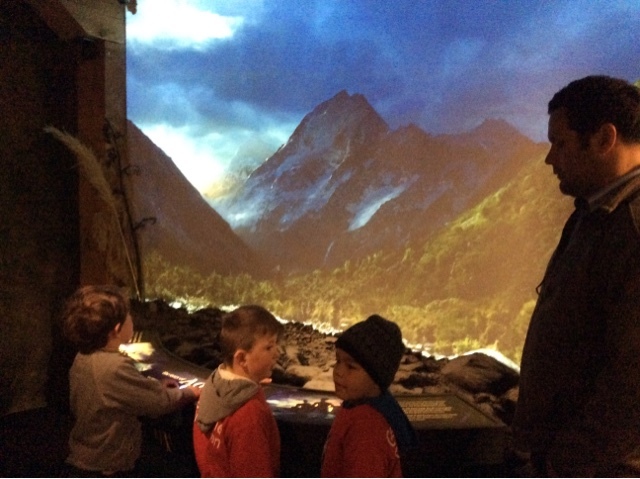 So the children explored Peel Forest and Mt Peel / Tarahoa. 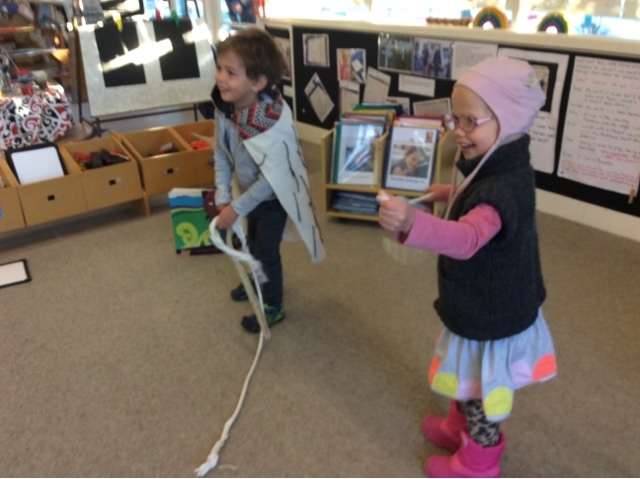 We utilised Maui's ropes to problem solve and help with taking the responsible risks needed on the spooky journey. 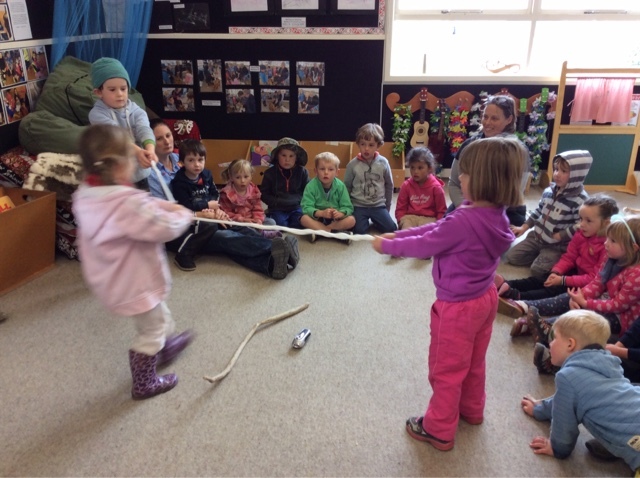 The tamariki were familiar with the rythm of the thier favourite story.."one with a rope, one with a stick and one with a light." They drew on their past knowledge and this helped them lead the story and make decissions as the story went along. 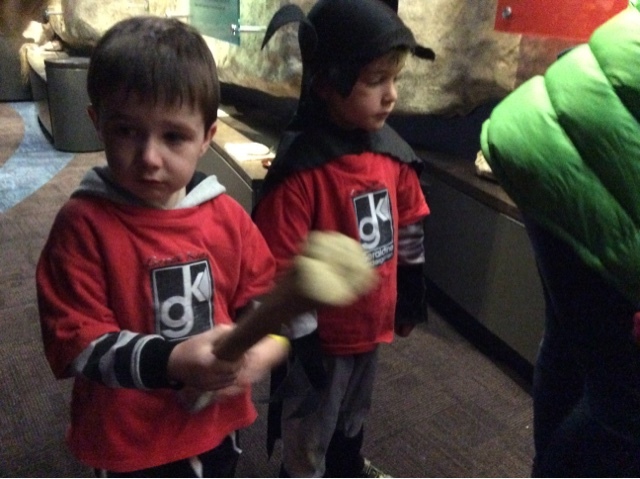 With the rope, stick, and light they went on an adventure to visit the 'Spooky Kindergarten'. 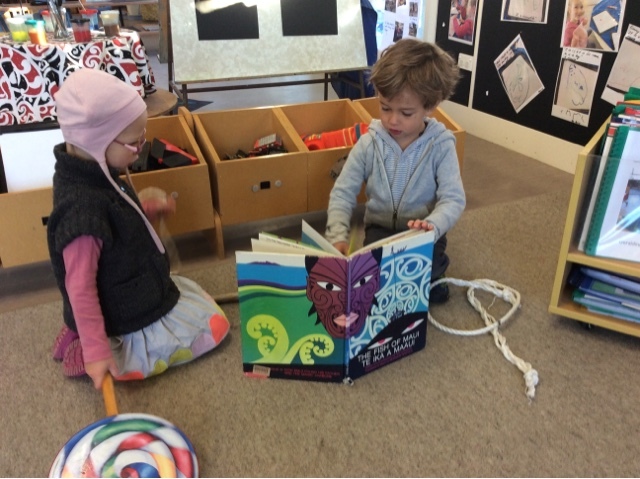 The tamariki were intrigued with the torch to see what they could find in the spooky Kindergarten. They found lions and bears! Just like the book, we asked did they dare to carry on looking? 'Yes we dare!" they replied. Using the torch really prompted their creativity in what could see in the story. The next day Louise repeated the story but split the girls from the boys. The girls sat in a circle to tend to the pretend fire and cook the kai. The boys grouped together and walked around the room with Archie, the Chief, leading the chanting, "We are hunting, we are hunting!" Only to return to the girls to say "There is no food!" This prompted Archie the next day to gather the stick and to rein-act the role of 'chief' with Charlotte joining him. 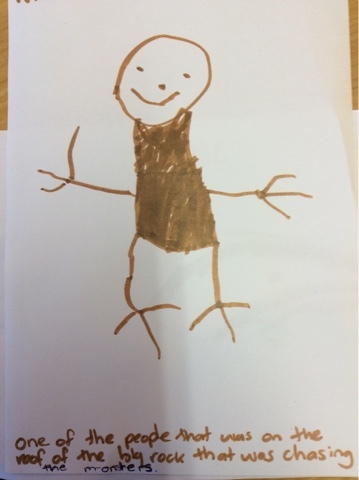 This shows how children need to go back to things to make sense of things. Bringing literacy to life helps children to build habits around thinking flexibly and communicating with clarity. We work together for maximum impact. Ka mahi ngātahi mo te tukinga nui tonu.